We are lucky to have wonderful resources in this area from award winning beaches to the incredible wildlife. The north east of Scotland may be famous for whisky and castles but a new website aims to highlight another reason that tourists should visit the region – the rich and diverse wildlife. From the sight of 80,000 geese leaving their roost site at the RSPB Loch of Strathbeg reserve to 120,000 breeding seabirds at Fowlsheugh our coast has much to offer; and it is not just birds. Aberdeen can claim to be the best city in Europe for watching whales and dolphins with bottlenose dolphins seen on a daily basis whilst the waters off Collieston are becoming a regular area to spot the mighty humpbacked whale. The new website Discover East Grampian Coast is being launched at the RSPB’s flagship Loch of Strathbeg reserve by Allan Garvie, Chair of the East Grampian Coastal Partnership, Councillor Alan Buchan, Vice Chair of Aberdeenshire Council Infrastructure Service Committee, Belinda Miller and Stephen Archer from Aberdeenshire Council and Ian Francis of RSPB. Richard Humpidge, RSPB Grampian Reserves Manager said: “The Loch of Strathbeg is not just a jewel on the Grampian coast but is one of the best places to go birdwatching in mainland Scotland. You don't have to be a specialist to appreciate the many birds close to the visitor centre for everyone to enjoy. The website gives details of walks, places to visit and green transport options. It also showcases all the accommodation providers in the area which have received awards for environmental responsibility. The development of the website has been funded by Aberdeenshire Council. 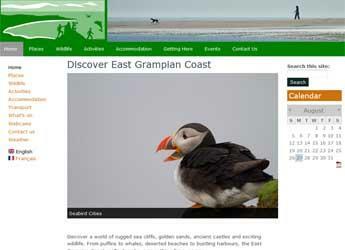 The Discover East Grampian Coast website is part of a package of green tourism work that the East Grampian Coastal Partnership is delivering on behalf of Aberdeenshire Council. East Grampian Coastal Partnership (EGCP) is a voluntary group of individuals and organisations who have an interest in the wellbeing of the local coastline. It is hosted at the James Hutton Institute in Aberdeen.